Game Giveaway of the Day. and face the test of your skills in solving amazing puzzles. Think you have what it takes to just walk away from a game? We dare you to try to break free from the addictive madness of Tetromino Challenge. It only takes seconds to learn, but you’ll need lightning-fast reflexes and the utmost precision to master the block-dropping action. Maneuver the blocks as they tumble down to form lines that make them disappear. The difficulty and tasks increase with each level, so make sure to keep your gaze fixed and your mouse hand steady! * Lively music and sound effects. Foxy Jumper 2 - the long awaited sequel to the popular arcade featuring a fox cub that couldn’t stop jumping. The objective is still the same (get to the door), but it’s not as easy as in the first game. Now the door is locked and you are to collect all treasures on the level before the key appears. Plus, there are more opponents now and they are much smarter. But don’t worry, Foxy has nuts he can throw at his enemies. ArcaMania 2 is a brick-busting classic Arcanoid clone in OpeGL with hi-color graphics, efects, sounds and monsters. Arcamania 2 offers everything players liked on awarded first sequel of the game: great playability, graphics, level design plus. Nicht installiert, deswegen keine Angaben zum Schlüssel! After an unexpected attack by the aliens, a long and exhausting war has followed. resistance. There is only one chance left. This chance is you. fearful. This is the only way to save planet Earth. Good luck, pilot. You’ll need it. is all about awesome action and the coolest cartoon-style animation you’ve ever seen. you must run, jump and kick your way through 88 levels filled with goodies to grab. tracks. This allows him to give them the boot! You’ll enjoy trying to take out more than one monster at a time and using the bonuses that pop up when an enemy bites the dust. helicopter and lets him take out monsters without getting hurt. vom bekannten Hersteller ..., hier scheint die Auswahl nicht so groß! Magic Ball is a highly addictive Arkanoid remake that won’t let you go outside for at least a week once you install it. The point of the game is to destroy all the bricks the level is comprised of using the rockets. Sometimes you will get bonuses for destroying the bricks. Those bonuses can be good ones - bullets, magnets or rockets, for example, - and getting them will help you to pass the level, or bad ones, such as “Jack - the Bat Killer” or ball Speed-Up, that will negatively affect your performance. Man kann sich aber nach den Angaben der anderen Spiele von dort richten. Snowy: Puzzle Islands is an adventure through a colorful world made of switches, moving platforms, teleporters and locked gates. Your goal on each of the game's 100 levels is to use these objects to help Snowy reach the exit. Along the way, you can collect fruit bonuses and other goodies. Puzzle Islands features a 60-level campaign for serious thinkers as well as an easier 40-level campaign designed to teach kids simple logic skills. Whether you're a seasoned puzzle game fan or just want to perform simple tasks while enjoying vibrant graphics and pleasant music, Puzzle Islands will appeal to you. In addition to the original game, registered users can download the free Simple Tasks add-on and purchase our Brain Shaker expansion pack, making for hours of brain-teasing fun for Snowy fans everywhere! The old amusing arcade racing game is back! All fans' requests came into play in more bonuses, the multiplayer mode, and advanced cars. What is really important is that the game became more interesting and adventurous! Explore new realities of competing against your friends and relatives! Be the first bombing your competitors! Take advantage of new spirited tracks! Dump the oil to put your competitors out of action! Have real double fun! CheboMan is a classic arcade game similar to Super Mario. The main character called CheboMan wanders along various landscapes and caves to find his friends. 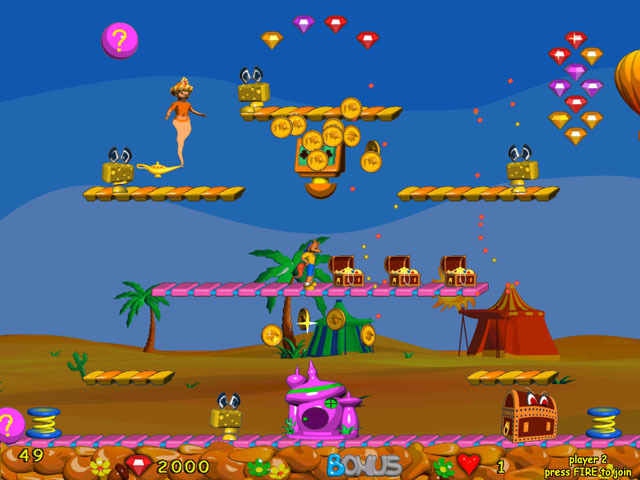 The objective of the game is to rescue all friends. You pass to the next level when you rescue the friend found at the end of the current level. But it’s not that easy, because numerous enemies will do their best to stop you. The game ends when you lose all your lives. A new version of CheboMan is complemented with a new amusing bonus – balloons. Pop the balloons to raise your score and continue on with your treasure-hunting and friends-saving expedition. * 18 breath taking episodes, each unlike others. Heute kommt mit Egyptoid eine weitere Arcanoid-Abwandlung. Spiel nicht mag, darum heute ohne aufwendigen Beitrag. An abstract from an official intelligence report: Our satellites have located as many as fifty alien interceptors rapidly approaching planet Earth. Detailed analysis of the digital image data revealed a larger object as well. Without a doubt, it’s the Big Brain, thought to be killed 5 years ago. Looks like we should start a search for a new hero right now! Regulärer Preis: €14.95 // $19.95. In Snowy: Space Trip, our courageous bear leaves the comfort of his arctic home and travels across space to rescue his alien friends from an army of nefarious robots. Your task is to guide Snowy as he runs and jumps his way across beautifully detailed levels, kicking robots in their metallic teeth and gathering his little green pals into a rocket ship for the trip home. The more aliens you can collect and return to the rocket ship at once, the more points you’ll earn. This isn’t easy, as an assortment of mechanical monstrosities will do their best to stop you in your tracks. Luckily, you can use a variety of bonuses to help clear the way, including a pickup that makes Snowy invulnerable and another that clears all enemies from the screen. Featuring 80 levels set in four unique worlds, awesome animation, the best music you can imagine and an easy setting for less experienced players, Snowy: Space Trip is an out-of-this-world adventure you won’t want to miss! schnell von meinem PC flog ... aber einigen gefällt es ja. It’s Foxy Winter in Foxy World - a perfect time to get ready for the winter holidays, dress up beautiful Christmas tree and get a few gifts for friends. But, as usual, there are some mean monsters that don’t like holidays and will do whatever it takes to ruin fun for everybody else. Don’t let these fiends destroy the holiday season by helping Foxy and his girlfriend pick up all gifts on each level. And don’t forget the star that will go atop the Christmas tree. The Complete Edition of our wildly popular release contains 150 of the most creatively designed levels ever seen in a Breakout offering. Nothing sits still as game pieces whirl across the screen in a psychedelic dance of epic scope. In addition, Hyperballoid will put your reflexes to the test as you flick your paddle back and forth in an attempt to capture and use a collection of outrageous powerups. Giveaway of the Day - wie dauerhaft sichern und speichern?